Your attention, please. That's what God wants, Leighton Ford discovered. It's the path to becoming like Christ. Distractions, fear and busyness were keeping Ford from seeing God's work in and around him. He was missing God. So he began a journey of longing and looking for God. And it started with paying attention. In these pages, he invites you to journey with him. Using the rich monastic tradition of praying the hours, Ford will walk with you, helping you pay attention to God's work in you and around you throughout each day and in different seasons of your life. If you're busy, distracted, rushing through each day, you might be feeling disconnected from God, unable to see how he's working. You might be missing him. But the way toward him starts with a pause and a prayer-with intention and attention-and becomes a way of life, awake and alive to the peaceful, powerful presence of God. Leighton Ford heads Leighton Ford Ministries, which seeks to help young leaders worldwide to lead more like Jesus and more to Jesus. For many years, Ford communicated Christ around the globe through speaking, writing and media outreach. He describes his current mission to be "an artist of the soul and a friend on the journey." 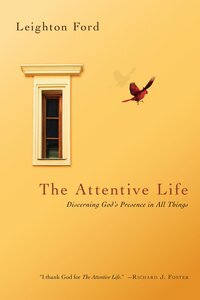 He is the author of Transforming Leadership and most recently, The Attentive Life.